The Unvarnished Truth About Business, Money, and Life. That principle guided Larry from bankruptcy and despair to massive wealth, worldwide fame as a bestselling author and star of A&E's hit television program Big Spender, and personal harmony and fulfillment. It has transformed the lives of thousands of people who have heard Larry's message and embraced his philosophy. And it's the foundational idea of an audio program unlike any you've heard before. Why success is actually very simple, and what you can do to keep it that way. How to tell if you're not working hard enough. Plus, a short list of things you can do to work better (i.e., improve your organization and ultimately make more money. Five ideas that will make you love your job. It's not necessary, but it sure helps. And it's a whole lot easier than you think. Respect: Why it's way more critical than you realize, why you probably don't give or receive it now (even if you think you do) and what you can - make that must - start doing right now to turn things around. How to become invaluable in six easy steps. Set things up so that it would be pretty darn painful for your organization if you weren't around, and you'll have honest leverage to start getting the promotions and raises you truly deserve. How to serve better and sell more. Pretty much everything boils down to these two skills. Take the steps to improve them, and you will blow people's minds, increase your salary, better your relationships, and transform your entire life. PLEASE NOTE: When you purchase this title, the accompanying reference material will be available in your My Library section along with the audio. This title also has additional supplemental material associated with it. To access this material, please visit Nightingale-Supplements. Download the accompanying reference guide. ;PLEASE NOTE: This title has supplemental material associated with it. To access this material, please visit Nightingale-Supplements. it's a good book but either pick this book or its called work for a reason. because they're the same thing with the exact same words verbatim . a waste of money if you buy both. This was a fun listen. Although for me it really was nothing new. If you have read many of the most popular self help books and personal finance books it will not be much new for you. If you're new to these areas this book is a great listen! Biggest takeaway was his focus on you being responsible for everything in your life. He made this point many times from different angles. Larry Winget's style is like no other!!! If you have never listed to this guy before, go for it. Some stuff you just need to hear loud and in your face, and it's all true. Larry is not the one to give you complex solutions to your problems. Actually the whole book banks on the ideea that life is simple and we know what we need to do to become successful...we just don't care enough to take action. We actually work hard to make things complicated in order to have an excuse in the end. This is the core philosophy of Larry. The book is dedicated to make you care and make you see things simpler...this way you realise the actions you need to take are actually simple and straight forward. I highly recommend the book to anyone overwhelmed by the ideea that life is complicated. 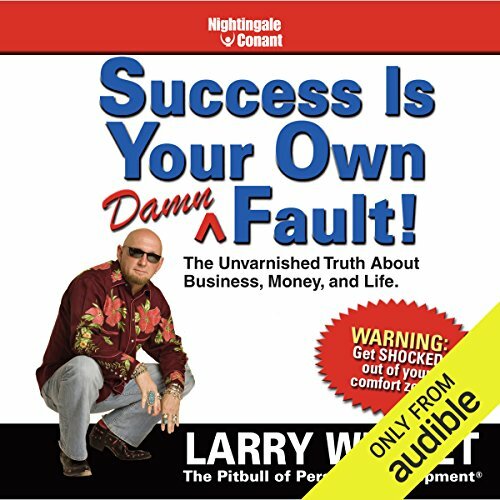 Where does Success Is Your Own Damn Fault rank among all the audiobooks you’ve listened to so far? Right at the very top! What was one of the most memorable moments of Success Is Your Own Damn Fault? You are responsible for your own life. Good or bad, you made the decisions in the past, that gave you what you have today. What does Larry Winget bring to the story that you wouldn’t experience if you just read the book? It made me think, seriously, about where I am, right now in my life, and where I would really like to be, instead. I have listened to many people in the past, about what one has to do, to change their lives. Some 'sugar coated' it, making it sound real easy to change your life. Larry Winget is the only one I have listened to, that does not 'pull any punches', 'beat around the bush', or make it sound like 'pie in the sky'. He is truly, truly, one of a kind. Larry is a great self improvement writer & fantastic narrator. He tells you what you need to know in simple terms without the bull crap. Refreshing, no-nonsense personal development advice. One of Larry's tips is out of date though: "Eat healthy food; healthy food us cheaper than unhealthy food". Sadly, this statement is no longer true, at least not in Western cultures. Which is not very common anymore. A good wake up call for the lazy & entitled. But will they listen? Doubtful but I think a few will convert. Some good ideas in here. Most of this stuff we all know deep down but it is always helpful to get a reminder/prodding from a guy who doesn't sugar coat. Thanks Larry, hope I run in to you sometime in the Valley. I've listened to many motivational books and this one seemed to be just par. Not a must have but not horrible. I would recommend this to someone that needs a pick in the pants to get started. His no nonsense speak will, or should, waken people who seem to be sleeping on the job of responsibility.